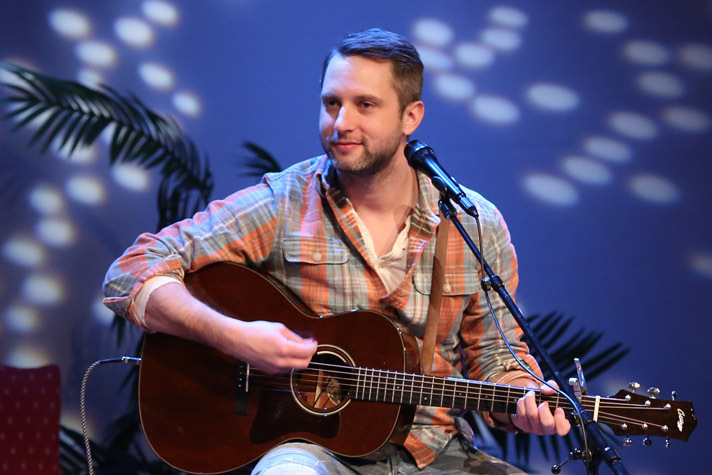 Brandon Heath has always loved a good story. 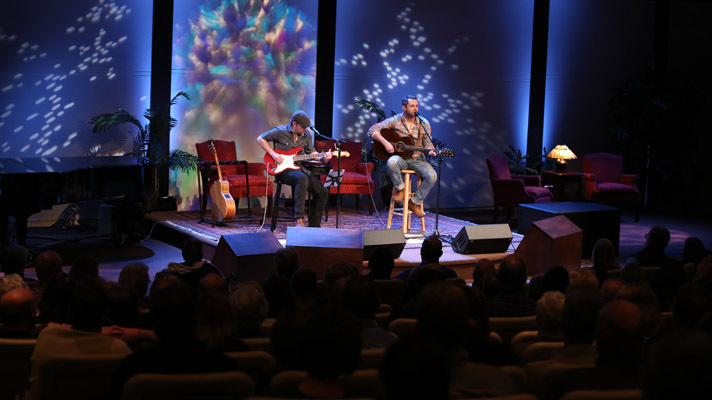 The popular Christian artist shared some of his favorites Thursday as part of the Billy Graham Training Center‘s “Evening at The Cove” series. Like the time he gave his life to Christ during a Young Life trip in British Columbia, Canada. It was on the ninth hole of a Frisbee golf course near the water. Taking a rock in hand to symbolize his old life, he threw it as far as he could into the ocean. There was also the time he befriended an astronaut and one of his songs, “Give Me Your Eyes,” was played in space on Space Shuttle Endeavour. “That was so cool,” he said. Just like the stories he told the audience Thursday, there’s a story behind each of his songs. 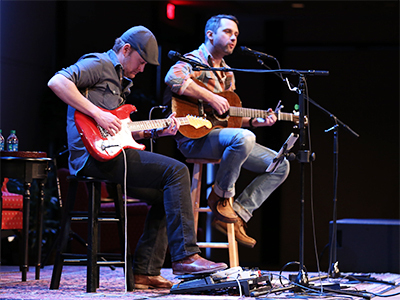 Brandon Heath (right) with guitarist Adam Lester, who has played with Heath on every album. Wearing a plaid button-down and jeans, and quick with a joke, he came across more as an old friend than an award-winning singer and songwriter. 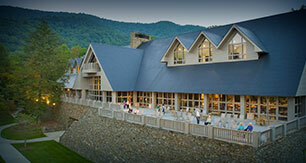 The Cove, a quiet getaway in the Asheville mountains, also hosted Heath in February 2013. 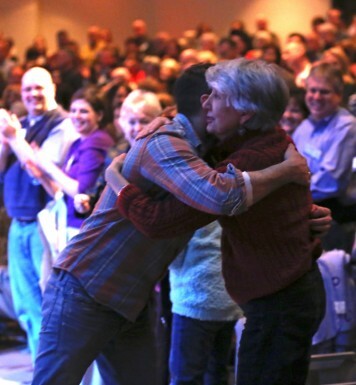 Heath, 35, said he loves being part of Billy Graham’s ongoing ministry. Thursday’s audience included people from at least 15 states—from Maryland to California, from Canada to Poland. Scott and Samantha Burnette are Heath fans who live a couple of hours away in Pigeon Forge, Tenn. Scott went to Montreat College, just a 15-minute drive from The Cove, but had never visited before the concert. “We felt like it was due time,” his wife said. The concert also brought four young men from Grace Baptist Church in Marion, N.C. Brothers Dylan and Tres Price joined Elijah Owenby and Clay Owenby (no relation) to celebrate Clay’s 15th birthday. Heath has garnered lots of attention from the Christian music scene for a while now—although he rarely talks about it. The Nashville native has won five Dove Awards and an Emmy. He’s also been nominated for five Grammys and an American Music Award. Before the concert, Heath learned that “Aunt Carol” loves the song “Dyin’ Day” about an inmate’s newfound relationship with Christ. He sang it for her Thursday. Some of his most popular songs are “Your Love,” “Jesus in Disguise” and “Give Me Your Eyes.” He wrote that last one after sitting elbow-to-elbow with a stranger on a five-hour flight. Heath never said a word to him and, looking back, said it was a missed opportunity to not only to share the Gospel, but to be the Gospel—to show someone that he cares. Although some concert goers weren’t familiar with Heath’s music before Thursday, judging from the standing ovation at the end, they weren’t disappointed. Gary and Martha Gibson, who are from Heath’s hometown in Nashville, said they appreciated Heath’s transparency and vulnerability. And his music. Tucked away in the majestic Blue Ridge Mountains of western North Carolina, the Billy Graham Training Center at The Cove equips people using God's Word to win others to Christ.